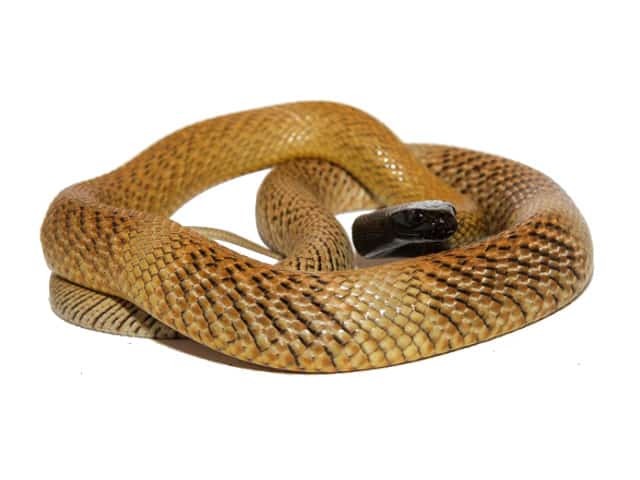 The inland taipan is considered the most venomous land snake in the world. Dorsal colour varies from pale fawn to yellowish-brown to dark brown, with the head and neck being several to many shades darker than the body. Colour changes seasonally, with individuals becoming darker in winter and fading in summer. The darker colour of head and neck allows the snake to heat itself while only exposing a smaller portion of the body at the burrow entrance. The eye is of average size with a blackish brown iris and without a noticeable coloured rim around the pupil. Can be housed individually in suitably sized plastic click clack storage containers to suit their size. Adults can be housed in a top opening laminated glass fronted melamine or ply built cabinet. My adults are housed in threes, one male & two females. The melamine cabinets are 2.1 meters long × 0.6 meters wide x 0.6 meters high (7 x 2 x 2 feet) & top opening. All cabinet glass is laminated glass. I have hide boxes at each end & one contains a small heat pad under a little mulch. My choice is dried out eucalyptus mulch & a little sand which settles to the bottom. I use 2 x 60 watt spotlight globes a meter apart. They are about 0.2 meters (0.6 feet) off the ground & they are adjustable, for height to suit winter or summer. In summer I lift all these globes up about 0.15 meters (0.5 feet) so its not too hot. The ambient temperature of the enclosure in summer should be 27-30 °C (80-86 °F) with a hot spot of 35-38°C (95-100 °F). During winter the ambient temperature is 20-22 °C (68-71 °F) with a minimum at night may be around 10-12 °C (50-54 °F). I have a vent at each side at ground level and a large one at the top. They are well ventilated. Water bowls for all my snakes are the 4 or 6 inch ceramic reptile ones. Drinking water is always available. The only time I make it humid is when she’s coming up to lay soon. This is done around the hide which contains the plastic removable lay box which contains the moistened vermiculite & peat mix. The other 2 hide boxes are dry. My inland taipans are generally fed on mice & rats. They will also feed on birds taking hatchling & small chickens. I feed them once a week or every two weeks according to the size of the prey. When you are handling an inland taipan make sure that you are very focused. You can’t look away for a second or they might get the better of you. Personally I handle this species with the hook & tail technique. 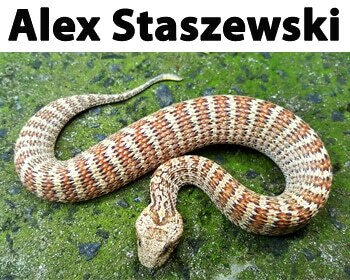 Remember, the more you “handle” your venomous animal the more you are adding risk of a potential accident or mishap that could result in a bite / envenomation. For both spot cleaning and major cleaning where all substrate is removed, the snakes are removed & put into a large plastic garbage bin. This species don’t seem to have any real issues with shedding if you offer them the correct humidity levels. As a species they are very hardy so there are no particular health issues except the common snake issues.